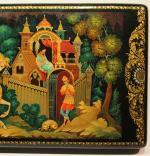 Masterfully hand-painted laquer box "The tale of the sleeping princess" after a poem of Russian poet Alexander Pushkin, it was executed by author Shubin on the famous Russian Lacque workshop Palekh by Moscow ca. in 1980s. 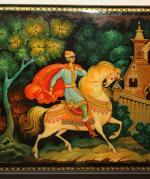 Inscription: signed in Russian “Shubin" lower right, titled in Russian" the tale of sleeping princess" lower left. Technique: lacque, oil on papier-mashe (a construction material that consists of pieces of paper, sometimes reinforced with textiles, stuck together using a wet paste (e.g., glue, starch, or wallpaper adhesive). The crafted object becomes solid when the paste dries). Measurements: 6 1/8" x 3 1/8" x 1 1/2" x "(15,5 x 8 x 3,8 cm ).